On writing a piece recently on The Kernel Brewery I touched on a beer which I had not had the opportunity to sample at the time - Kernels Export Stout London 1890. Having tasted the beer twice recently I began to consider the importance time plays in the life of a beer. Bottle maturation is one of those strange arbiter's of the brewing world, with few guide lines for the consumer. At the lower end of the ABV scale it is essential for Bottle Conditioned beers to allow flavours to develop and come together, or as Bass put it elegantly in their Bottling Instructions of 1880, to 'ripen'. At the higher level ( ie: 7% and above ) it is equally important, but here however we are entering more uncharted waters! This, in a way, makes it all the more interesting as a beer that is able to mature and ' improve ' with age is a fascinating development, but one the general public struggle to grasp. There are of course parallels in the world of wine. I remember Paul Symington of Dow's Port telling me that his father Michael enjoyed his Vintage Ports when they had matured in bottle with time over several years, taking on more mellow characteristics ( in the traditional fashion ). He on the other hand preferred them young bursting with berry fruit, more tannic and powerful, but to him equally enjoyable. In other words neither is wrong but subject to preference. However, despite Paul's preference, the point of ' Vintage Port ' by its very nature is that it is structured in such away that the component wines used in the blend give it ' longevity ' - and this is the prized element that makes it what it is. There are similarities here with higher ABV bottled beers and whilst some are happy to drink them when young, others prefer them when aged. But, there can be little doubt that for beers such as these to show their true ' potential ' they do require more time to mature in bottle. The advantage that ' time' begins to offer here is that they then start to take on a startling array of flavours, mimicking everything from fruit, vegetables, food and flora, plus everyday aromas and tastes such as tar and coffee. Two other valuable elements that such ageing can bring to high level ABV bottled beers is greater depth and complexity. This brings an added 'dimension' to the beer that can only come about with maturation and time. These two elements in particular can transform a beer, making it a multi-faceted experience, rather than a simple one dimensional combination of flavours ( such as fruity / sweet or alcoholic ) the product starts out as. The problem for the brewer is to convey this information to the public in terms they will understand. Bottled beers ( unlike Wine and Cider ) have always had the disadvantage that ' Best Before ' dates have ruled there drinking worth in the public's consciousness ( compounded by the fact that in recent years some larger brewers have placed unnecessary marketing gimmickry on 'born' or 'created' dates ) . At the higher ABV end of course this is not the case, and guidance could be the answer. There is no reason why a brewer should not give some indication on their label that the beer will benefit on keeping, especially if it gives a chance of presenting it at its most complex and rewarding. 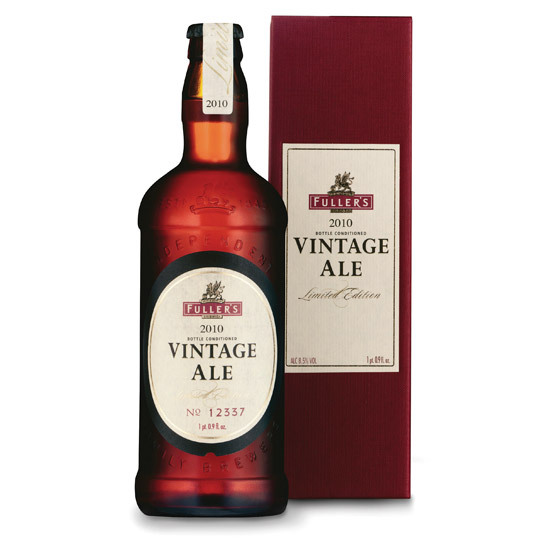 Currently the type of information given by Fuller's on their annual Vintage Ale is a good example, stating that it will improve long after the best before date. When trying the two Kernel Export Stout 1890's recently I was bearing these thoughts in mind. The first bottle had only recently been brewed at the brewery, and although it had all the hallmarks of great things to come, was very much in its infancy. The second bottle, which had been matured for several months longer, was a completely different experience. The beer had an almost impenetrable blackness and the aroma was an intense combination of espresso, high roasted coffee bean and a touch of bittering iron. All very bright, giving and fresh. The fully textured palate was equally impressive with flavours reminiscent of high coco solid dark chocolate, roasted coffee bean, molasses and treacle with a subtle touch of creaminess. All the flavours were clean, pronounced and in balance and the beer had gained a considerable depth on ageing, and will continue to improve further with time no doubt. Probably one of the finest UK bottle conditioned beers I have tasted in 2010, and one Truman's ( the originators of the recipe ) would have been proud of ! Full marks to The Kernel Brewery for producing such an excellent ( and exciting ) beer. Lets just hope the public learn to give it the time it deserves to show its true colours. The rewards after all are more than worth waiting for!